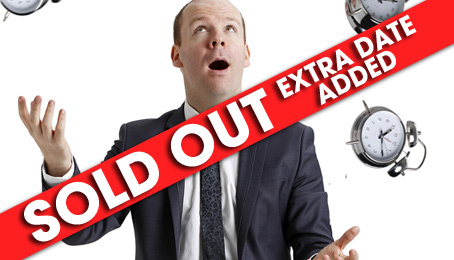 Neil Delamere's show on Saturday 6th April has now SOLD OUT! Due to such high demand we have now added a second date on April 5th. Tickets are on sale NOW from Ticketmaster outlets nationwide and online or from the Royal Theatre Box office on 0818 300 000 or 094 9023111. Currently one of the biggest names on the Irish comedy scene, Neil Delamere is back on stage this autumn with his highly anticipated brand new show, DeleMere Mortal. In his eagerly awaited new show, the star of RTE’s The 2nd Republic, BBC’s The Blame Game and Fighting Talk, Michael McIntyre's Comedy Roadshow and Channel 4’s Stand Up for the Week, Neil, comes to the realisation that he has now lived in Dublin as long as he has lived in his family home in Offaly. But what exactly has Neil learned in the 16 years since he left home? Find out for yourself when Neil dabbles in a little witty self-reflection and good spirited fun with a trip down memory lane aidedby original footage from 90’s quiz show, Blackboard Jungle, when he captained his school team to victory.